"I need to sell it, even discounting it!" As a matter of course it depends on the industry, 'a quotation that is required to be approved' is often needed in the business scene. Sometimes numbers of Quotations which are different in 'Delivery deadline' or 'estimated price' are needed. However, for the supervisor, he / she cannot approve on so many quotations that look alike so soon. Is the 'Delivery Deadline' right? Is the 'discounted price' fair? Is the 'expiration of quotes' proper? 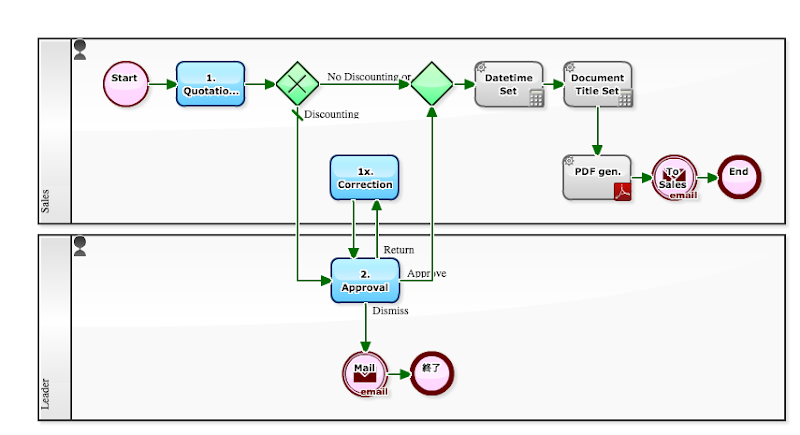 The following Quotation Approval flow is to generate Quotation PDF automatically after the quotation data have been approved. On the Step of approval judgement, the approver can concentrate on the job. For example, it is also easy to make a judgment by comparing with the past quotations that had been approved or rejected. 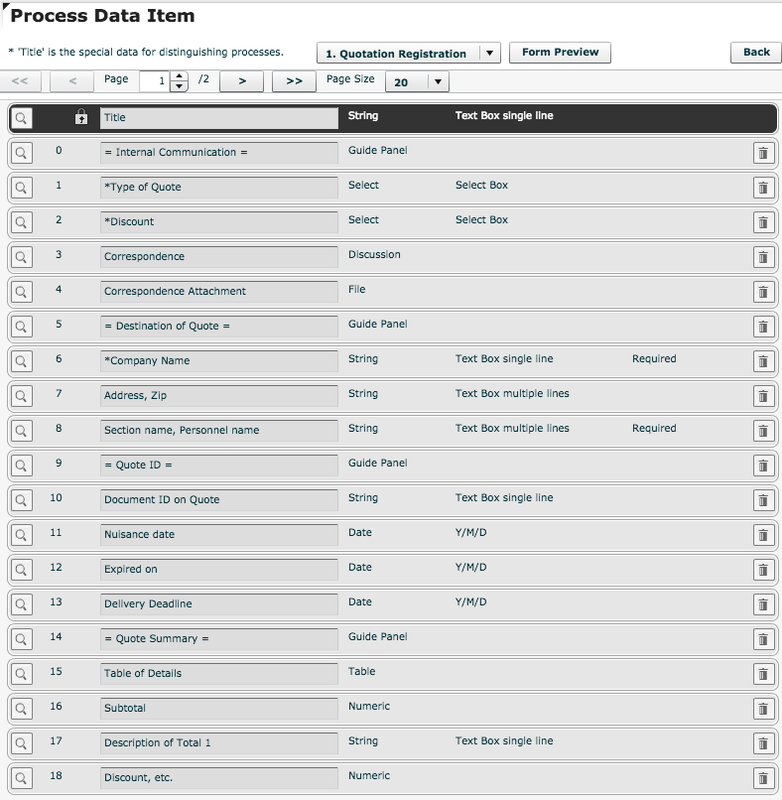 As a matter of course, quotation data will be accumulated beautifully, if the Quotation approval operation is processed along this Workflow. Along with, approved quotation PDF will also be accumulated. The knowledge of predecessor will be taken over. Isn't it wonderful? 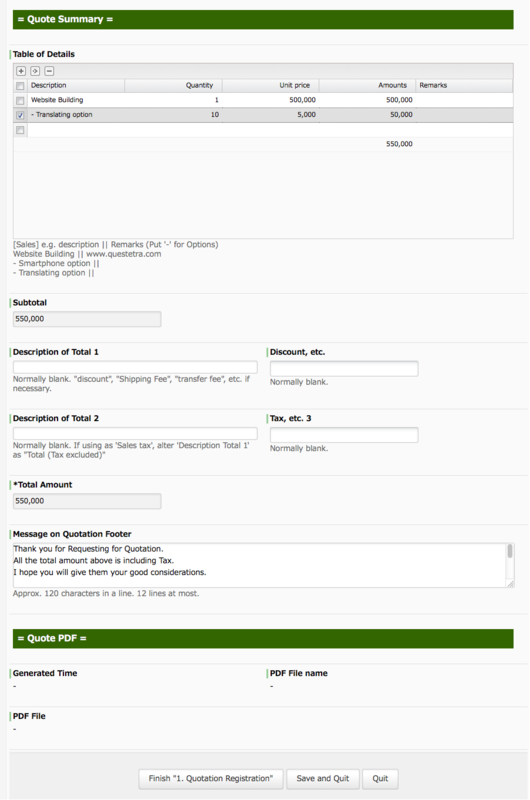 A 'Quotation PDF' will be automatically generated by inserting 'Quotation Data' into "Template PDF for Quotation". Therefore, mis-transcription of approved data won't be happening. In addition, in this "Quotation Approval flow", quotations which are not discounted (that is approval is unnecessary) can be generated. Even though it is very simple, it will not proceed to [2. Approval] if "No" is selected in the data item of "Discount?" upon inputting in [1. 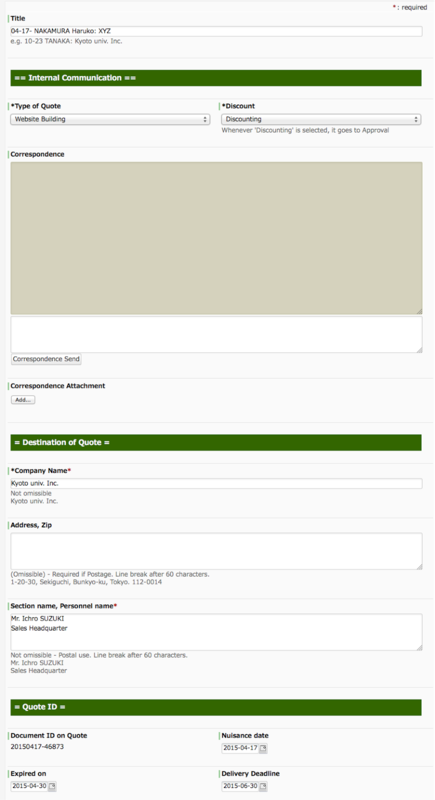 Quotation Registration]. That is, though many people would feel creating of template PDF is difficult or cumbersome, this Sample-retrieving feature will be very helpful for people who are not accustomed to creating template PDF. 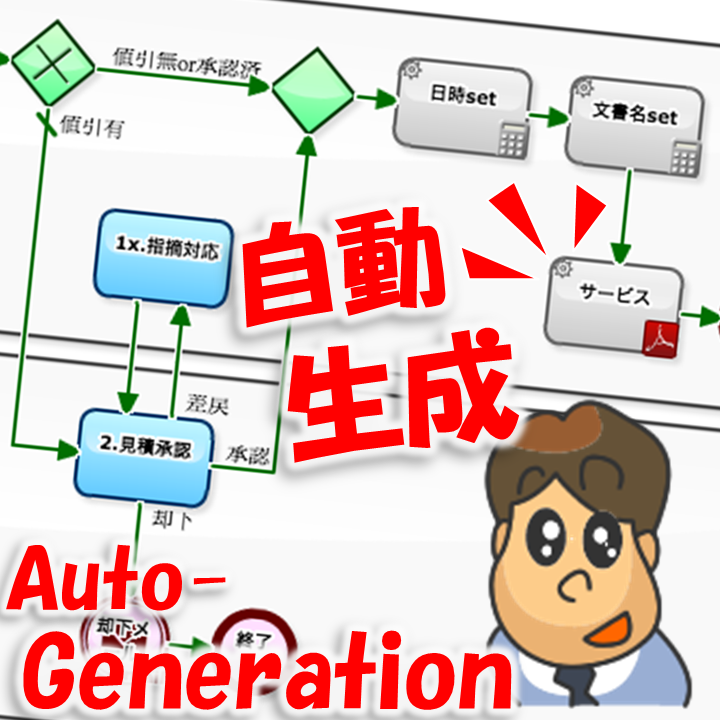 From another point of view, I can say it becomes to allow anyone to experience its Document Auto-generation function. You can try PDF Auto-generation immediately by retrieving Sample PDF in the [Modeling screen] and then going back to the Property of the Process Model and registering it.